Using bold flowers in your small space can transform your rooms from quaint to special. Most of us live in small spaces, but that doesn’t mean that we can’t enjoy the happiness that comes with bold and grandiose decor, in this case the use of bold flowers in your small space. In fact small spaces are perfect for decor like bold flowers because their impact can be stronger and more satisfying to behold. Bold can come from color, size, type, or arrangement. Don’t be afraid to experiment with any or all of these. While there are some rules you’ll want to keep in mind, in the end it’s all about what pleases you. Gathered here for inspiration and ideas are some photos from across the web of bold flowers used in small spaces and what makes them so special. 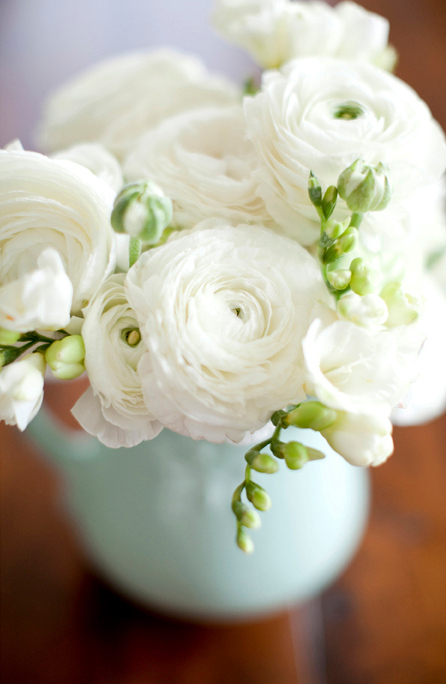 You may also want to visit Jerilee’s article in our A Lovely Garden journal: How to Arrange Flowers. Here the use of large, pink blossoms in a mug sets the stage for relaxation and happiness. This bouquet draws attention to the cozy sitting space in the middle of the room, prompting conversation and fabulous eye candy. The warm, bold, darker shade of blossoms anchors the room and holds together the lighter pinks that you see throughout the space. The same large, pink blossoms work much the same way as in the above example. They anchor the room and draw attention to the dining/sitting space. Here, however, as opposed to bringing in a pop of color that brings together smaller hints of the same color, these blossoms expand the area. Don’t feel as though you could be overdoing a color in a small space, not when it is the crucial elements that define the space that focuses on that color. Notice that all the other colors surrounding the immediate space are neutral, and that the adjoining living spaces use that color as a smaller pop, thus accentuating this section to a beautiful and lively space of its own. When working with a space that offers a variety of colors as a backdrop (seen here with colorful wallpaper, rug, and books), neutral is the way to go when defining the main sitting space. 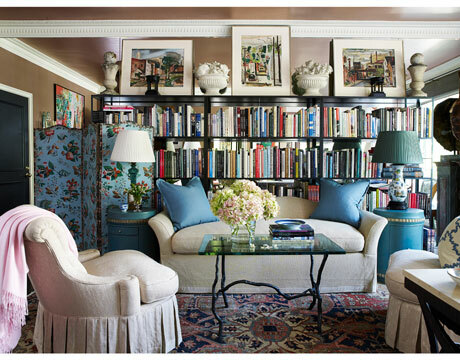 White hydrangeas, here, extend the sitting area in this room, much like the pink blossoms of the above example. The white seating is tied together by the beautiful, clear vase, white, hydrangea arrangement which sets this simply decorated social area as the focus of attention. Choosing to place the white bouquets in white pedestal bowl vases at the top of the bookshelves in the backdrop help to add height to the room and to extend the comfort level of the center seating area; smart decorating move. Some bouquets are bold in their use of scents and color pallet, not just floral circumference. 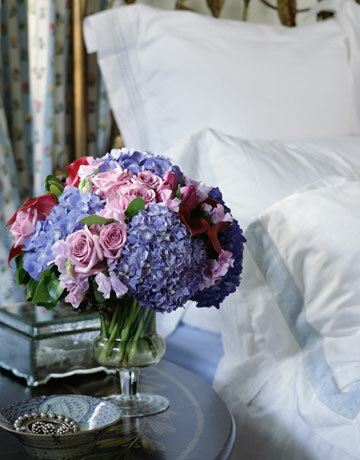 Use a bouquet such as this to attract attention to a nearby spot, such as a guest bed. Here the pop of color, variety of blossoms, and fresh perfumes, lend an appreciation to the visitor and sets a special and soothing tone for their visit. Think about where you want the focus of your space to be. Think about the feeling you want to bring into that space. Think about what you want the color(s) you use to do. Utilize and incorporate your boldest bouquet in the most active section of your space.